At TennesseeDachshunds, ( formerly known as Stendachs), we are AKC Miniature Dachshund Breeders. 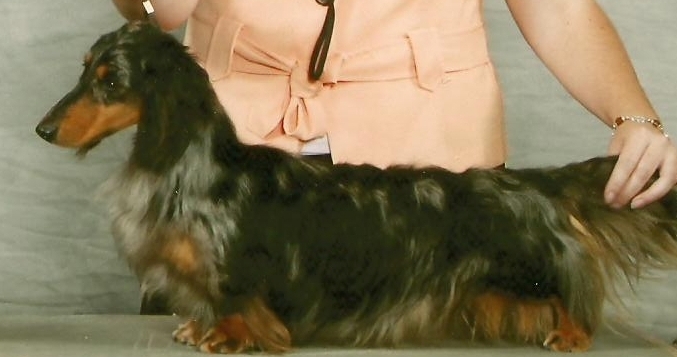 We specialize in breeding miniature long and smooth hair dachshunds. We breed for the next show generation, but we will have pet puppies for sale. Our dachshunds are bred for temperament, conformation and overall quality. You can rest assured, when you get a Dachshund from Tennessee Dachshunds, whether for show or pet, your dog will come with all appropriate immunizations, and well socialized. At TennesseeDachshunds research is done for each breeding, pedigrees are studied and my breedings are always "done on paper" well in advance of the actual mating to ensure the best match possible. I posess a breeders certificate from AKC, and I am a member of the Cumberland Hound Club, Cumberland Dachshund Club, and the National Miniature Dachshund Club. Our pedigrees include some of the best lines in the USA and import lines. While we don't breed for color, our resulting Dachshunds come in a great variety. You can find puppies in Red, Dapple, Brindle, Black & Cream, and of course, black and tan. We have dapple dachshund puppies for sale which are beautiful. TennesseeDachshunds is located in Winchester, TN., which is located 45 minutes northeast of Huntsville, Alabama, and one hour west of Chattanooga, Tn. We are 1.5 hours south of Nashville, Tn. We do ship both inside and outside of the US. We currently have Dachshund Puppies for sale in Tn., as well as all across the United States, and have sold puppies to Canada, Grenada WI, and Finland . Please feel free to call or visit if you are interested in a beautiful Dachshund Puppy. CH Whangarei (we call him Garei) born in South Africa. Sire: NZ CH Misty Dale Makin the Blues at Getwick. Dam: CH Stoneleigh Half A Sixpence Of Getwick. Garei is the sire of 4 CH puppies. We Are very Proud of our boy.